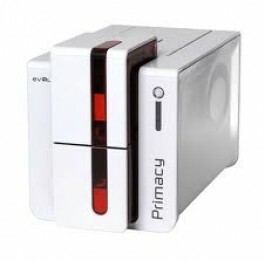 The Primacy printer is extremely fast, powerful and efﬁ cient. Using advanced encoding technologies, this desktop printer is the best solution for issuing personalized cards, from the most simple to the most secure. Primacy is available in single and dual-sided versionsand is the ideal choice for printing and encoding cards in medium and large runs. Primacy is perfect for printing large runs because it personalizes color cards in record time: up to 225 cards per hour for singlesided printing and 140 cards per hour for dual-sided. You save time and increase productivity. Using the encoding option which can be installed on site, add encoding options at any time.